Oh hey, it’s Mega Man Universe. Remember that game? I was pretty excited about it back in 2010. It was controversial to fans for a variety of reasons. 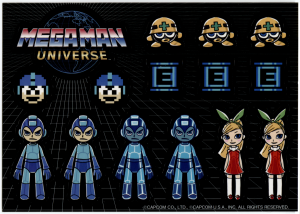 The art style (particularly the “Mega Grump” face); using the “Mega Man” title over “Rockman” worldwide while including “Mega Man”, “Rockman” and “Bad Box Art Mega Man” as different playable characters; the reports of questionable game controls and physics coming from early press demo play; the questionable tie-ins; Inafune’s unfortunate departure in the middle of development; the fact that the game was a love letter to Mega Man 2 so soon after Mega Man 9 and countless remixes of “Wily Stage I” had over-saturated fans’ nostalgic favor of the game… There was a lot going on. I cared not for the naysayers. There was plenty of time for game play and graphics to be tweaked considering how early it was then in the development cycle. More importantly, this title was going to be filled with content and promising ideas, like a kickin’ soundtrack by The Megas; a playable character customization and creation mode; a level editor mode to rival Powered Up but on a console that millions more people actually played; the ability to play as other Capcom characters like Ryu and Arthur–or even more thrilling, the potential for non-Capcom licensed characters to get “MEGA-fied” (think Super Smash Bros or Super Mario Crossover). If Capcom had actually followed through with this concept, there is a good chance we could all be playing Mega Man 2 as Pac Man and Samus Aran with endless custom-made stages right now. Proving once again that we are not living in the best of all possible universes. But this topic isn’t about any of that. Mega Man Universe had me excited about it for yet another reason: a potential new cast member who was perhaps long overdue. In the vast majority of Mega Man platform games, there is quite a bit of ambiguity on where you will respawn if you lose a life. Wondering if you made it far enough in the level to not have to start from the beginning is something of a tradition in the series, leading to some tense moments that can result in frustration or relief. One could even consider it a part of the game experience itself, though there have been a handful of titles that employed rather clear or marked save points. One was the aforementioned Mega Man Powered Up for PSP, which featured as its save point a pink mechanical orb floating in a glowing energy field. When the player reached this item a pointed flag with the classic Mega Man 1UP icon would spring up, showing tangible proof and reassurance that a checkpoint had been reached. But as Mega Man 3‘s Rush teaches us, why create an item when you can create a unique character to do the job? Mega Man Universe asked this same question and their answer looked something like this. This character was visible in some of the earliest released game trailers, but had scarcely had a few seconds of screen time. Even odder, while the rest of the game had a 3D rendered look, this robot was comprised of retro 8-bit dot graphics that made it purposefully stand out. I instantly latched onto it, excited about the possibility of a new cast member, or alternately, at exploring the possibly that not every robot you encounter in a stage is necessarily an enemy. It’s a concept that has intrigued me since the grasshopper robot Battan appeared in Mega Man 4. Couldn’t there be some robots (not sent by Dr. Light) that aren’t running amok, or that actually just want to help end the rampage of their robot brethren? There was no way to tell what its background might be, but it was clear that save points in this game would exhibit more personality. To my knowledge, Capcom never announced the name of this character, so for now I am just calling it Savebot. After the game was cancelled, I scoured through the online game footage in an effort to collect many images of this character to better understand it. Not an easy undertaking, since a lot of the footage was poor resolution, often from shaky hidden cameras by intrepid game show convention attendees. Result of the effort to collect screenshots of this elusive creature. 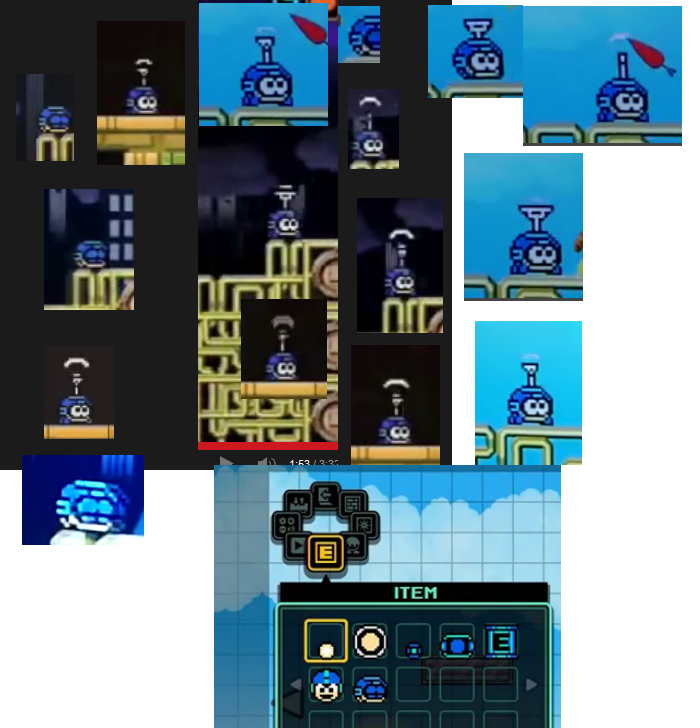 Video of the stage editor shows that Savebot can be placed into custom levels as an item as well, just as one could in Powered Up. One could therefore argue that Savebot is nothing more than an item and perhaps didn’t even have a name. Perhaps, but I disagree. 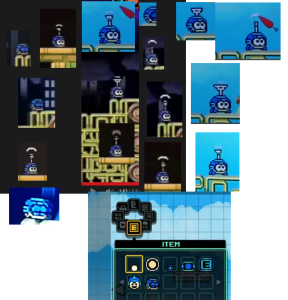 Savebot’s interactive function necessitates it be placed deliberately, so it makes the most sense to have it in the items section rather than grouped with stage enemies or hazards. Rush, Beat, and Eddie have each been represented as item icons for gameplay purposes plenty of times before, but they are still support characters in a plot sense. At least, Savebot will always be a full-fledged character to me. Savebot “best guess” sprite sheet, by #20. 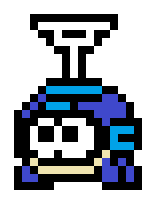 I created a custom sprite sheet of Mega Man Universe’s Savebot. It’s as close to the concept as I could manage, but as a disclaimer I have no graphical experience and no way beyond the collected images above to compare its accuracy. 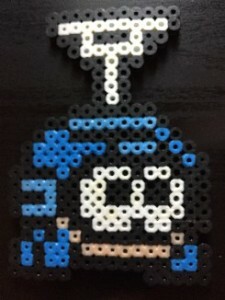 Savebot may have lost its place in Mega Man history, but he still has a place on my desk in Perler bead form. Let it stand as my tribute to the lost potential of a martyred game. 3 Comments to "Saving the Universe"
I vaguely remember seeing Savebot in some screenshots. It’s nice to see someone making the effort and focusing on him! 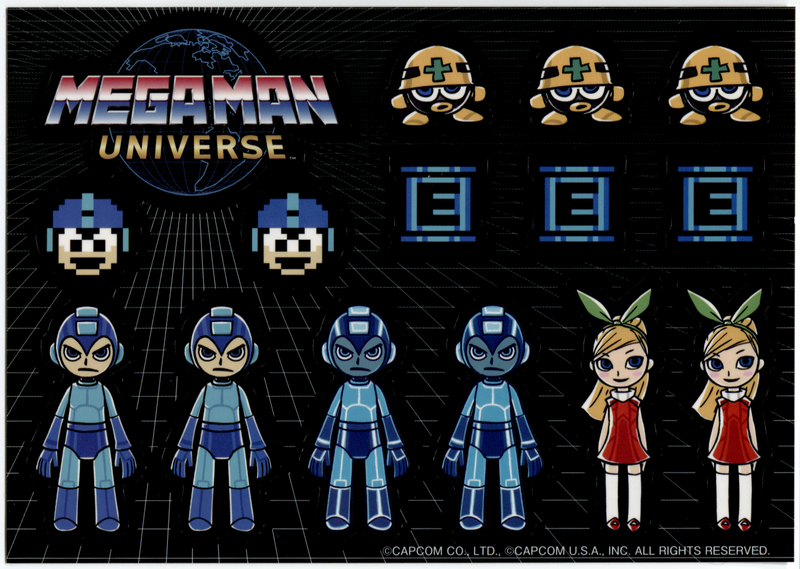 I would’ve been more excited about MMU if they hadn’t been using Mega Man 2 as a base. Yes, Mega Man 2 is a nice game. However, it’s over represented in the series, and I actually prefer to replay the later games on the NES instead, with the improved graphics, alternate level paths and the MegaBuster. For all my excitement over Universe back then, I never noticed that little guy. I like the idea that maybe he activates a beacon signal for you to teleport to after dying.